Eliminating the Electoral College research papers propose ideas on how presidential elections can be changed by getting rid of the electoral college. Research papers on eliminating the electoral college may want to look at previous attempts to eliminate the current nations voting system for presidential elections. This type of research paper can be written like what you see below. Eliminating the Electoral College research papers report that there have been a spectrum of proposals in the 107th Congress to modify the current system of presidential selection through the electoral college. Direct popular election: H. J. Res. 3 and H. J. Res. 5 both provide for direct elections, with no minimum threshold percentage of the vote. Electoral votes would be awarded individually by congressional district to the highest vote-getter. The two “super-” or “senatorial-,” votes would be awarded to the candidate receiving the most votes state-wide. Such a system would probably increase the influence of low-population states (which would usually continue to vote as a unit or near-unit), whereas large states would see their current electoral advantage fractured. Bonus electoral votes: H. J. Res. 25 envisions an added 102 electoral votes (two for each state and the District of Columbia) to be awarded en bloc to the winner of the majority or plurality of popular votes, irrespective the distribution of other electoral votes. Such a system would increase the total number of electoral votes to 640 of which a minimum 321 would be necessary for final victory. This is intended to preclude the election of a president winning less than a plurality of the popular vote. However, such a system does not address the underlying problem of voter fraud in extremely close elections. Indeed, it could encourage a candidate to concentrate on energizing his voter base in states which he was already likely to win, and bypassing other states, if only to gain the 102 “super” electoral votes. Agenda Voting Vs. Approval Voting - Eliminating the Electoral College research papers propose ideas on how presidential elections can be changed. In Favor of the Electoral College research papers can make for interesting debate on how America runs its presidential elections. 1912 Presidential Election and Woodrow Wilson - Presidential Elections research papers discuss the aspects of an election, such as the electoral college. 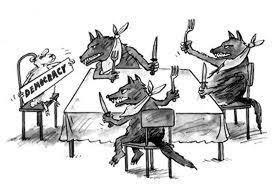 Democratic Party ... Electoral College research papers examine the role and value of the system of voting in Presidential Campaigns. Republican Party - Research that focuses on the Republican Party, its history and the current state of the party. A Woman As President Research Paper looks at the significant role that women play in presidential elections and the possibility that a woman may be president soon. Voter Participation - In the year 2000 presidential election, just over 50 percent of America's eligible voters went to the polls. Measuring Political Attitudes research papers look at the correlation between political views and education and how to measure them for Presidential Elections. Internet and Election Campaigns Research Paper discusses an example of a paper on the 2006 Midterm Campaign and the 2004 Presidential Election. Soft Money - Soft Money research papers on political campaign contributions are custom written when you order a research paper from Paper Masters. Political Discourse - Political discourse is done among political parties during conventions or during elections. Right to Vote research papers discuss the ability of participating in the political process of a democracy. Paper Masters writes custom research papers on Eliminating the Electoral College and propose ideas on how presidential elections can be changed by getting rid of the electoral college.